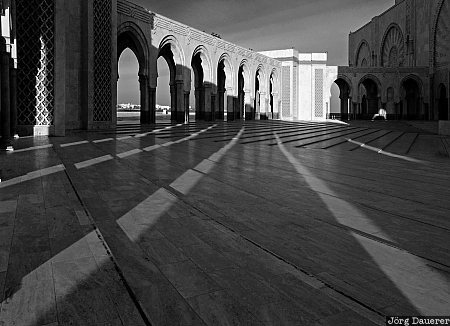 Back-lit repetitive arches and columns and their shadows at the Hassan II Mosque in El Hank. El Hank is in Grand Casablanca, at the coast of the Atlantic coast in Morocco. This photo was taken in the morning of a sunny day in March of 2010. This photo was taken with a digital camera.